The Kämmer & Reinhardt doll company was formed in 1886 in Waltershausen, Thuringia, Germany by Ernst Kämmer and Franz Reinhardt. 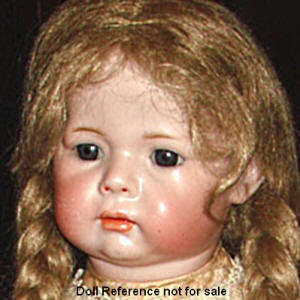 Early K & R dolls were made of wax. K & R bisque doll heads and bodies were designed by them, but most heads were manufactured by Simon & Halbig which is why heads bear both marks. They also purchased heads from Kling and Schutzmeister & Quendt. 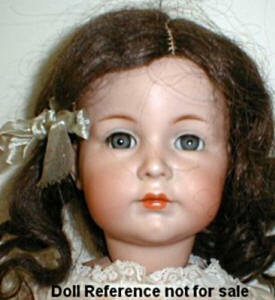 From 1886 to 1909 K & R made only dolly faced dolls with a bisque head on a composition ball jointed or kid body, many with an open mouth and teeth. After 1909 they made many types of dolls; bisque, composition or celluloid heads and even cloth costume dolls with wired bodies dressed in various professions. K & R supplied some bisque heads used to make Emile Berliner's gramophone talking dolls in 1890-1894. 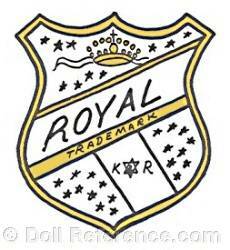 In 1902 K & R purchased the Heinrich Handwerck doll company and about 1920 they acquired the Simon & Halbig company as well. K & R is probably best known for character baby and child dolls. Kammer & Reinhardt Character Child Doll, 22" tall, bisque socket head, composition ball jointed body, glass eyes, feathered brows, painted upper and lower eyelashes, closed pouty mouth. Character Child doll face, doll mold 115, she's 22" tall. This K & R bisque head doll mold 115 was also copied by American doll makers; Effanbee for their 1912 Billy Boy composition doll head, Horsman who made a 1915 Boy doll also a composition head and is also similar to German doll maker; Käthe Kruse's 1912 Fiamingo head mold. K & R Character Child doll mold 115, 22"
1901+ Character Child Doll, Mein Liebling (German for: "My Darling"), 12-32" tall, bisque socket head, composition ball jointed body, glass eyes, feathered brows, painted upper and lower eyelashes, open mouth or closed mouth. Mein Liebling doll mold K * R, 117A has a open mouth (OM). 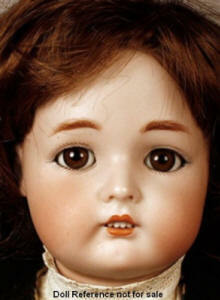 Shown on right; closed mouth (CM) Mein Liebling, bisque doll head is marked doll mold K * R, 117. Doll mold K * R 117N Mein Liebling doll - some have flirty, tremble eyes. 1909+ Character Doll, Kämmer & Reinhardt Baby doll, Bauz Baby or Kaiser Baby, 11-20" tall, bisque socket head, composition jointed bent limb baby body, molded painted hair, painted eyes, open/closed mouth. 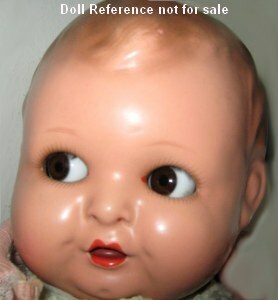 The 100 doll mold, Kaiser Baby dolls also came with glass eyes and were distributed in the United States by both George Borgfeldt and Strobel & Wilken. 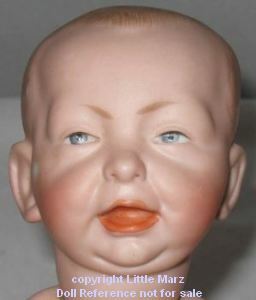 Character Doll, 11-24" tall, bisque socket or shoulder head, composition jointed body or kid, or bent limb baby body, molded and/or painted hair or wigged, painted or sleep eyes, open, closed or open/closed mouth. 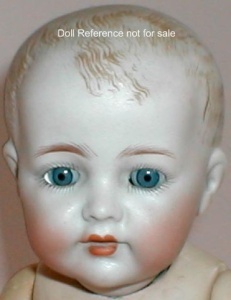 K & R Character Baby Boy doll mold 127, 11" tall, bisque socket head, composition jointed bent limb baby body, painted molded hair, glass sleep eyes, feathered painted eyebrows, painted lashes, open mouth. 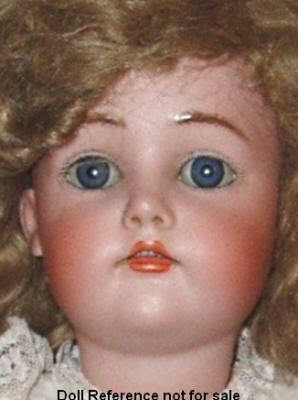 Child Doll, 5-28" tall, bisque head on a ball jointed composition and wood body, feathered painted brows, glass sleep eyes or painted eyes with painted lashes, open or closed mouth, wigged, some may have pierced ears. 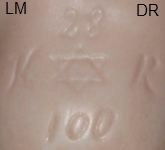 Doll mark KR, doll mold K & R + 191, 192, 191G, 192G, 290, 401, 403. K & R Child doll mold 403, 20"
ca. 1928-1932 Baby Puz doll, 19-30" tall, biscaloid head, lightly molded painted hair, flirty sleep eyes, open mouth with tongue, jointed composition baby bent limb body. Doll marked Germany. ca. 1928+ K & R Baby Puz doll, 19"
ca. 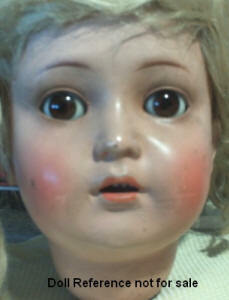 1928+ Rosi doll, 25", biscaloid head, glassene eyes, closed mouth, wigged, composition jointed body. Doll mark Rosi Germany + her size number in centimeters. marking on her lower neck rim between 50 - 99, it is her size in centimeters, rather than a mold number. Other registered trademark doll names used by Kammer & Reinhardt are; Aviator dolls, 1931 Bébé Camerose sold only in Paris, France, Charakter Puppe doll (Character Doll), Der Schelm doll (The Rascal doll, Der Unart doll (Naughty One), Dis Kokette doll (the Coquette doll), Marie doll and Peter doll mold 101, Elsa doll and Walter doll mold 102, Carl doll mold 107, Elise doll mold 109, Hans doll and Gretchen doll mold 114, Majestic doll, Mein Kleines doll (My Little Ones doll), My Darling doll, The Flirt doll of the Royal Line, Max doll mold 123, Moritz doll mold 124, Favorite doll mold 155 was distributed by FAO Schwartz in 1900-1927.